Hu, W., Lum, G. Z., Mastrangeli, M., Sitti, M.
Untethered small-scale (from several millimetres down to a few micrometres in all dimensions) robots that can non-invasively access confined, enclosed spaces may enable applications in microfactories such as the construction of tissue scaffolds by robotic assembly1, in bioengineering such as single-cell manipulation and biosensing2, and in healthcare3,4,5,6 such as targeted drug delivery4 and minimally invasive surgery3,5. Existing small-scale robots, however, have very limited mobility because they are unable to negotiate obstacles and changes in texture or material in unstructured environments7,8,9,10,11,12,13. Of these small-scale robots, soft robots have greater potential to realize high mobility via multimodal locomotion, because such machines have higher degrees of freedom than their rigid counterparts14,15,16. Here we demonstrate magneto-elastic soft millimetre-scale robots that can swim inside and on the surface of liquids, climb liquid menisci, roll and walk on solid surfaces, jump over obstacles, and crawl within narrow tunnels. These robots can transit reversibly between different liquid and solid terrains, as well as switch between locomotive modes. They can additionally execute pick-and-place and cargo-release tasks. We also present theoretical models to explain how the robots move. Like the large-scale robots that can be used to study locomotion17, these soft small-scale robots could be used to study soft-bodied locomotion produced by small organisms. Zhou Ye, G. Z. L. M. S.
A method for reversibly attaching a phase changing metal to an object, the method comprising the steps of: providing a substrate having at least one surface at which the phase changing metal is attached, heating the phase changing metal above a phase changing temperature at which the phase changing metal changes its phase from solid to liquid, bringing the phase changing metal, when the phase changing metal is in the liquid phase or before the phase changing metal is brought into the liquid phase, into contact with the object, permitting the phase changing metal to cool below the phase changing temperature, whereby the phase changing metal becomes solid and the object and the phase changing metal become attached to each other, reheating the phase changing metal above the phase changing temperature to liquefy the phase changing metal, and removing the substrate from the object, with the phase changing metal separating from the object and remaining with the substrate. Guo Zhan Lum, Z. Y. M. S.
The present invention relates to a method of fabricating a shape-changeable magnetic member comprising a plurality of segments with each segment being able to be magnetized with a desired magnitude and orientation of magnetization, to a method of producing a shape changeable magnetic member composed of a plurality of segments and to a shape changeable magnetic member. 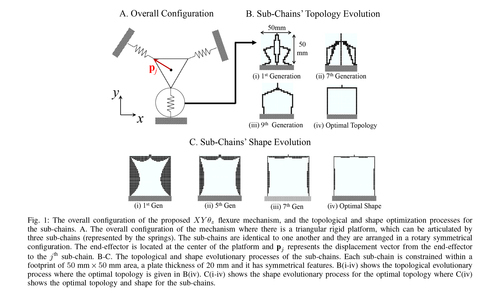 Lum, G. Z., Pham, M. T., Teo, T. J., Yang, G., Yeo, S. H., Sitti, M.
The development of optimal XY θz flexure mechanisms, which can deliver high precision motion about the z-axis, and along the x- and y-axes is highly desirable for a wide range of micro/nano-positioning tasks pertaining to biomedical research, microscopy technologies and various industrial applications. 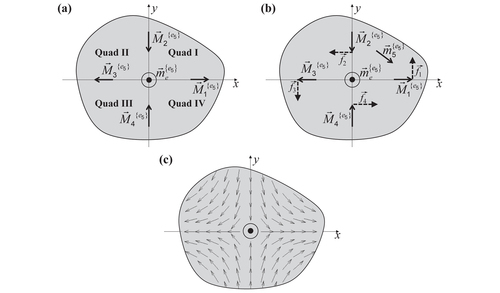 Although maximizing the stiffness ratios is a very critical design requirement, the achievable translational and rotational stiffness ratios of existing XY θz flexure mechanisms are still restricted between 0.5 and 130. As a result, these XY θz flexure mechanisms are unable to fully optimize their workspace and capabilities to reject disturbances. Here, we present an optimal XY θz flexure mechanism, which is designed to have maximum stiffness ratios. Based on finite element analysis (FEA), it has translational stiffness ratio of 248, rotational stiffness ratio of 238 and a large workspace of 2.50 mm × 2.50 mm × 10°. Despite having such a large workspace, FEA also predicts that the proposed mechanism can still achieve a high bandwidth of 70 Hz. In comparison, the bandwidth of similar existing flexure mechanisms that can deflect more than 0.5 mm or 0.5° is typically less than 45 Hz. Hence, the high stiffness ratios of the proposed mechanism are achieved without compromising its dynamic performance. Preliminary experimental results pertaining to the mechanism's translational actuating stiffness and bandwidth were in agreement with the FEA predictions as the deviation was within 10%. In conclusion, the proposed flexure mechanism exhibits superior performance and can be used across a wide range of applications. 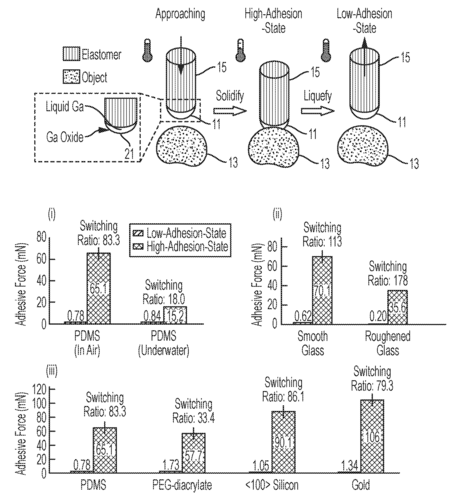 Diller, E., Giltinan, J., Lum, G. Z., Ye, Z., Sitti, M.
Ye, Z., Lum, G. Z., Song, S., Rich, S., Sitti, M.
Gallium exhibits highly reversible and switchable adhesion when it undergoes a solid–liquid phase transition. The robustness of gallium is notable as it exhibits strong performance on a wide range of smooth and rough surfaces, under both dry and wet conditions. 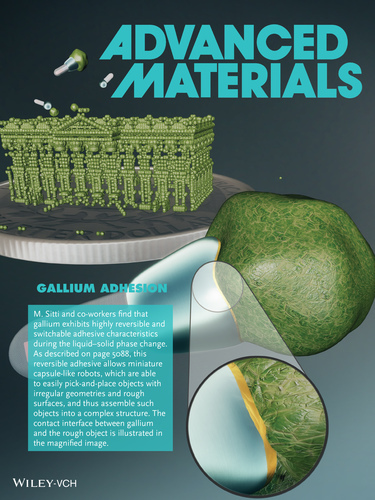 Gallium may therefore find numerous applications in transfer printing, robotics, electronic packaging, and biomedicine. Lum, G. Z., Ye, Z., Dong, X., Marvi, H., Erin, O., Hu, W., Sitti, M.
Shape-programmable matter is a class of active materials whose geometry can be controlled to potentially achieve mechanical functionalities beyond those of traditional machines. Among these materials, magnetically actuated matter is particularly promising for achieving complex time-varying shapes at small scale (overall dimensions smaller than 1 cm). 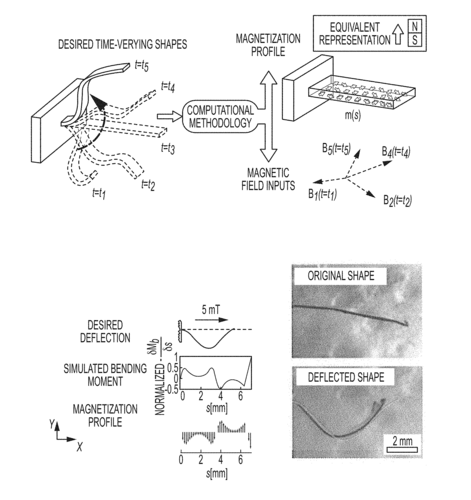 However, previous work can only program these materials for limited applications, as they rely solely on human intuition to approximate the required magnetization profile and actuating magnetic fields for their materials. 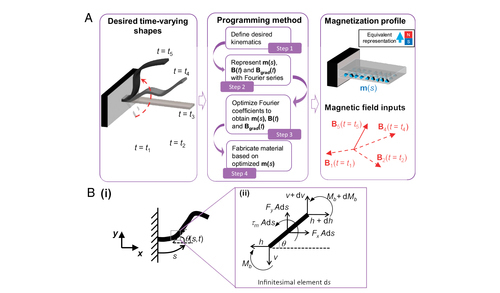 Here, we propose a universal programming methodology that can automatically generate the required magnetization profile and actuating fields for soft matter to achieve new time-varying shapes. 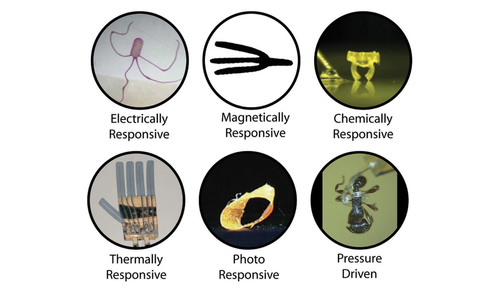 The universality of the proposed method can therefore inspire a vast number of miniature soft devices that are critical in robotics, smart engineering surfaces and materials, and biomedical devices. Our proposed method includes theoretical formulations, computational strategies, and fabrication procedures for programming magnetic soft matter. The presented theory and computational method are universal for programming 2D or 3D time-varying shapes, whereas the fabrication technique is generic only for creating planar beams. Based on the proposed programming method, we created a jellyfish-like robot, a spermatozoid-like undulating swimmer, and an artificial cilium that could mimic the complex beating patterns of its biological counterpart. 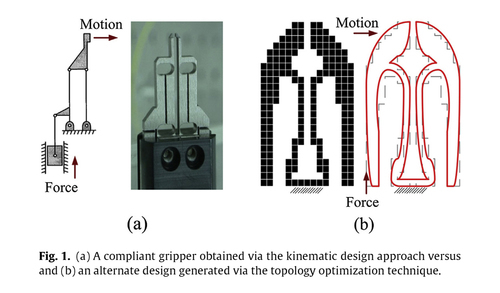 Lum, G. Z., Teo, T. J., Yeo, S. H., Yang, G., Sitti, M.
Flexure-based parallel mechanisms (FPMs) are a type of compliant mechanisms that consist of a rigid end-effector that is articulated by several parallel, flexible limbs (a.k.a. sub-chains). Existing design methods can enhance the FPMs’ dynamic and stiffness properties by conducting a size optimization on their sub-chains. A similar optimization process, however, was not performed for their sub-chains’ topology, and this may severely limit the benefits of a size optimization. Thus, this paper proposes to use a structural optimization approach to synthesize and optimize the topology, shape and size of the FPMs’ sub-chains. The benefits of this approach are demonstrated via the design and development of a planar X − Y − θz FPM. A prototype of this FPM was evaluated experimentally to have a large workspace of 1.2 mm × 1.2 mm × 6°, a fundamental natural frequency of 102 Hz, and stiffness ratios that are greater than 120. The achieved properties show significant improvement over existing 3-degrees-of-freedom compliant mechanisms that can deflect more than 0.5 mm and 0.5°. These compliant mechanisms typically have stiffness ratios that are less than 60 and a fundamental natural frequency that is less than 45 Hz. 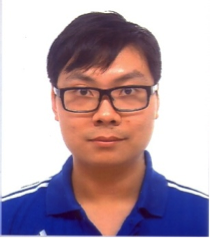 Lum, G. Z., Teo, T. J., Yang, G., Yeo, S. H., Sitti, M.
This paper introduces a new design approach to synthesize multiple degrees-of-freedom (DOF) flexure-based parallel mechanism (FPM). Termed as an integrated design approach, it is a systematic design methodology, which integrates both classical mechanism synthesis and modern topology optimization technique, to deliver an optimized multi-DOF FPM. This design approach is separated into two levels. At sub-chain level, a novel topology optimization technique, which uses the classical linkage mechanisms as DNA seeds, is used to synthesize the compliant joints or limbs. At configuration level, the optimal compliant joints are used to form the parallel limbs of the multi-DOF FPM and another stage of optimization was conducted to determine the optimal space distribution between these compliant joints so as to generate a multi-DOF FPM with optimized stiffness characteristic. 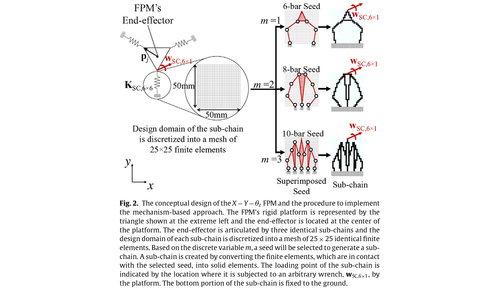 In this paper, the design of a 3-DOF planar motion FPM was used to demonstrate the effectiveness and accuracy of this proposed design approach. Lum, G. Z., Diller, E., Sitti, M.
Six-Degrees-of-Freedom Remote Actuation of Magnetic Microrobots. Diller, E. D., Giltinan, J., Lum, G. Z., Ye, Z., Sitti, M.